Each year, more than 500,000 people are diagnosed with dementia in the United States. As stunning as that figure is, countless family members and caregivers are also affected by each diagnosis. Families are faced with the need to make vital end-of-life decisions about medical treatment, legal and financial matters, and living situations for those who no longer can; no one is prepared for this process. And many caregivers grapple with sadness, confusion, guilt, anger, and physical and mental exhaustion as dementia enters its final stage. In Making Tough Decisions about End-of-Life Care in Dementia, Dr. Anne Kenny, a skilled palliative care physician, describes how to navigate the difficult journey of late-stage dementia with sensitivity, compassion, and common sense. Combining her personal experience caring for a mother with dementia with her medical expertise in both dementia and end-of-life care, Dr. Kenny helps the reader prepare for a family member's death while managing their own emotional health. Concrete to-do lists and lists of important points provide information at a glance for busy caregivers. Each chapter concludes with a list of additional resources for more information and help. 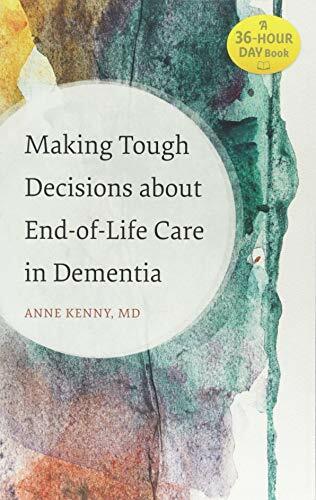 Making Tough Decisions about End-of-Life Care in Dementia is a lifeline, an invaluable guide to assist in the late stage of dementia. If you have any questions about this product by Johns Hopkins University Press, contact us by completing and submitting the form below. If you are looking for a specif part number, please include it with your message.